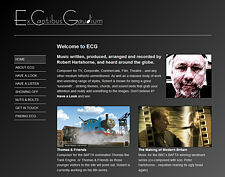 ReedDesign has just finished a complete redesign of the website of award winning composer Robert Hartshorne who goes under the scholarly business sobriquet of ECG – Ex Cantibus Gaudium – Enjoyment Through Melody. The site includes 60 audio and nearly 100 video clips that show off Robert’s great musical talent, including sections on Thomas and Friends and Andrew Marr’s The Making of Modern Britain. This entry was posted on Tuesday, June 15th, 2010 at 2:13 pm and is filed under Web Design. You can follow any responses to this entry through the RSS 2.0 feed. Both comments and pings are currently closed.